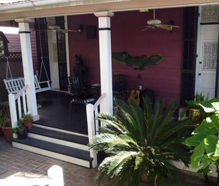 The Bywater Bed and Breakfast is a traditional New Orleans-style "double shotgun" – a one-story Victorian cottage with the usual "painted lady" multi-colors and trim. Its exterior walls are raspberry with white trim, pink detailing, and navy blue shutters. 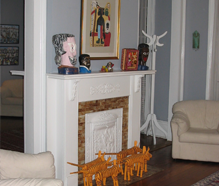 It is furnished with contemporary and antique furniture and a large collection of folk, self-taught, and outsider art by Louisiana artists. 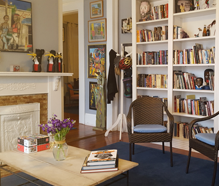 The public rooms, which all guests may use, include a double front parlor, a library with a large and growing collection of fiction set in New Orleans and nonfiction covering many aspects of the city and state, and a collection of Louisiana music on CDs that guests may play while at the B & B. 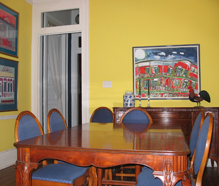 Public rooms also include the dining room, where we serve the daily continental breakfast, and the porch and patio. All guests are most welcome to spend time in all these public rooms and, of course, may choose to relax in their own private spaces. Louisiana art decorates every room; bedrooms feature special, folk art themes such as Mardi Gras and Adam and Eve/Garden of Eden. We provide guide books and other sources of tourist information, and weekly magazines such as Offbeat that describe "what's happening" around town. We try to keep up with new restaurants and have a collection of restaurant menus so guests can get a foretaste of what is being served. The back porch and patio are pleasant for reading, conversation, or just unwinding after a busy day. There are porch swings and chairs, ceiling fans, a large black bear carved by Ivy Billiot, gardens, and a lily pond. A tin roof covers the porch and provides afternoon shade, as well as the sound of rain on tin on hot summer days. Guests love the comfort these spaces offer, along with the chance to get to know other guests. 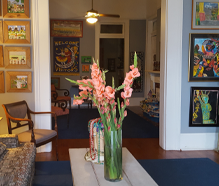 Events Hosting: In addition to lodging, Bywater Bed & Breakfast is perfect for small and medium-size events. With its library, two parlors, patio, and lush courtyard, its spaces can accommodate private parties, small corporate meetings, workshops, and receptions. Click here to find out more.